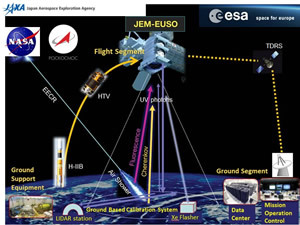 JEM-EUSO is a new type of observatory to be attached at the International Space Station or orbiting as a free flyer, based on a UV very large telescope, which uses the whole Earth as detector. It will observe, from an altitude of several hundreds of km, the fluorescence tracks produced at (330-400) nm by Extensive Air Showers (EAS) originated by UHE primaries which traverse the Earth’s atmosphere at ultra-relativistic speed. JEM-EUSO will be operated for three years in Nadir configuration to maximize statistics at the lowest energies in order to cross calibrate with the current generation of ground-based detectors. The instrument will be then tilted (about 30°) with respect to Nadir in order to exploit a larger amount of atmosphere and to maximize the statistics of events at the highest energies. JEM-EUSO will significantly increase the exposure to UHECRs compared to the largest ground-based air shower arrays presently in operation. The JEM-EUSO program is made of different experiments using fluorescence detectors. EUSO-TA, installed at the Telescope Array site in Utah in 2013, is in operation; EUSO-Balloon flew on board a stratospheric balloon in August 2014; EUSO-SPB was launched on board a super pressure balloon on April 24th and flew for 13 days; EUSO-SPB2 is in phase of construction for a long duration flight in 2022. Moreover, Mini-EUSO is in final phase of integration to be installed inside the International Space Station (ISS) in early 2019, while a much larger detector, K-EUSO, to be attached outside the ISS, is in phase A stage. TUS, the Russian mission on board the Lomonosov satellite in orbit since April 28th 2016, is now included in the JEM-EUSO program. 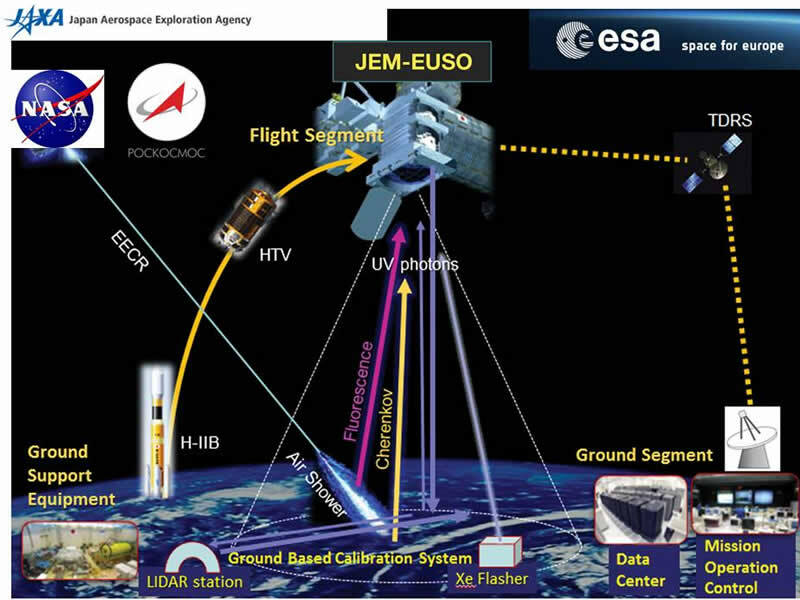 The final goal of the JEM-EUSO program is to send in orbit an experiment with a year time exposure more than one order of magnitudine of Auger. In this contest, a large mission, POEMMA (Probe Of Extreme Multi-Messenger Astrophysics), has been recently approved by NASA for a study phase.